There was an easy, intuitively understandable interface at public transport busses that tells you that the bus will stop at the next station: a red transparent area with black letters, stating «STOP» or «BUS WILL STOP» («BUS HÄLT» in German) that lights up after the stop request button was pressed (similar to the picture below). 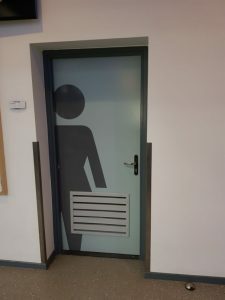 As this is information and not a warning, it is illuminated continuously, and is not blinking, until the doors open after which it is switched off. The word STOP as used in Germany and the red light can also be expected to be understandable for foreign guests. Display in a public transport bus north of Kassel, Germany, 11. August 2008, 17 hours, Translation of the text in the red area at the bottom: “Desire to stop recognised / automatic approach activated”. The bottom text, apart from being nonsense, is too small, has too many words; a large STOP would be a better option. The green H in the yellow circle is the sign for bus stop along the road, also for those that will be passed (to be exact, it is a tram stop sign, the bus stop sign is slightly different), not a sign for a need to stop (e.g., the red octogon with in white STOP). And the worst – the text area; the text and both Hs are slowly blinking – 3 secs on / 3 secs off. It is necessary to look for more than 3 seconds to make sure that my desire to stop has been recognised…. Off-phase of the blinking text, or… will not stop? 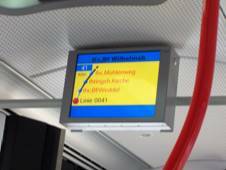 The busline information is given as 41 as used in time tables and on the bus´ front display, but also with for digits (0041), unusual in the Kassel area. 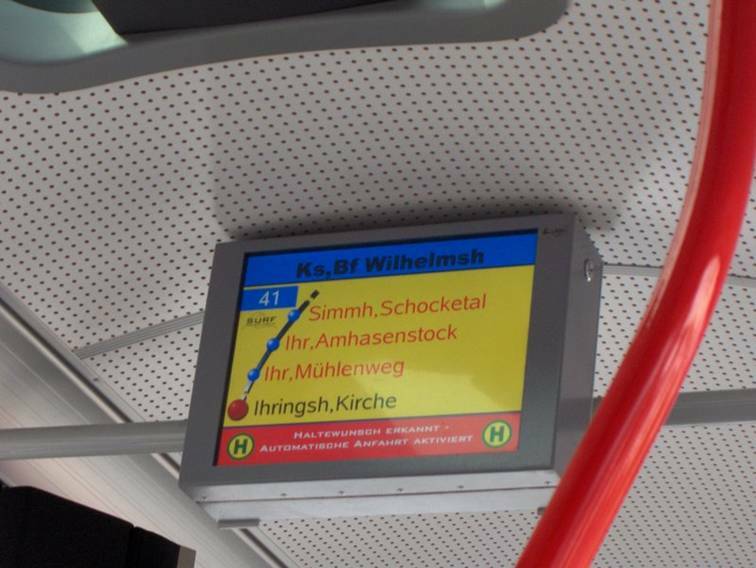 Unnecessary and unusual abbreviations: “Ks,Bf Wilhemsh” should be “KS” usually used for Kassel, “Bhf” as the common abbreviation for railway station (Bahnhof) and “Wilhelmshöhe” would easily fit on the display; also “Am Hasenstock” instead of “Amhasenstock” would make more sense.